If you're tired of catching bluegills, and you want to take your fishing to the next level, largemouth bass should be one of the fish on the top of your list. So, if you'd like to learn a thing or two about catching bigmouths, I'm sure the following tips will help. 1. Largemouth bass are easiest to catch in early spring. As the water temperature rises from 0°C to 7°C, you'll find them in shallow waters, up to 3 meters deep. As the weather warms up and the water temperature increases, especially the big ones will move to deeper water. In fact, as a general idea, surface fishing for largemouths is always less productive than mid-water or bottom fishing. And usually, the big ones tend to keep close to the bottom, in places where they can stalk their prey. 2. Bigmouths can be caught on various baits, live and artificial. But since in quite many places the use of live baits are forbidden, most anglers use lures. There are 3 categories of lures which do wonders in largemouth fishing: spinnerbaits, crankbaits and jigs. From the crankbaits range, the medium and deep divers are the best. For jigs Cover Craws, plastic worms and flipping jigs are great. And when it comes to spinners, the ones with Indiana and Colorado blades are best. If you're going with live baits, you can use almost everything in the book, beginning with the classic worms, up to minnows or other small fish, leeches, mole crickets, frogs etc. 3. As a general idea, if the water is murky, go with light-colored lures. Choose white, chartreuse, yellow or red colored lures. In case the water is quite clear, it's best to go with lures as closely colored as possible to the small fish the bass are feeding on. 4. In case you haven't mastered a baitcasting reel yet, and you wouldn't like to spend your first bass fishing expedition learning how to use it properly and untagling bird nests, it's best to go with a small to medium spinning reel. Make sure the reel you choose is rated for the line you're going to use, though. This is quite an important aspect, that many anglers neglect. Also, never overfill the spool. 5. When it comes to rods, you should choose yours depending on the method of fishing you will use. For example, if you're going to be actively fishing, using lures, a fast action rod, between 6'-7' should do. You shouldn't spend a fortune on it, get the cheapest one at your local tackle shop. As a general idea, Ugly Stiks are great to start with. 6. The best test line for largemouth should be between 10-15lb. If the water is very clear, it's a good idea to use fluorocarbon, because it's less visible and won't spook the fish. But if you don't want to spend the extra buck for fluoro, monofilament should work good enough too. 7. Although bass are not spooky fish in general, it's always a good idea to minimize the impact of the splash of the lure. To do that, always cast past your targeted spot. This way, instead of scaring the fish, the splash has a much better chance to draw attention. Looking for a balanced largemouth bass tackle? 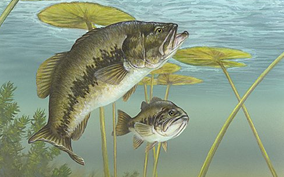 Find out more, here: How To Catch Largemouth Bass - Largemouth Bass Tackle | Humminbird Fish Finder Reviews.